Agriculture remains a key frontier industry for Sarawak, as examplified by two major events the Sarawak Agrofest 2018 and International Conference on Agriculture and Agro-based Industry Sarawak 2018 (ICAAS 2018), which are related to the development of agriculture in the state — being held last month. The Sarawak Agrofest 2018 wase held from Oct 20 to 28, while the ICAAS 2018 was held from Oct 23 and 24 at Penview Convention Centre (PCC) in Demak. While the Sarawak Agrofest aims to actively promote agriculture agro-based industry in the state, the ICAAS 2018 will be a fitting platform to share knowledge and experience on new approaches and mechanisms that have been proven to be successful in other parts of Malaysia and other countries, which can be adopted in the state, said Deputy Chief Minister Datuk Amar Douglas Uggah Embas, who is also the Minister of Modernisation of Agriculture, Native Land and Regional Development of Sarawak. A key theme for both events was smart farming, which involves the integration of advanced technologies into farming practices in order to increase production efficiency and the quality of produce. According to Uggah, the state government strongly believes that industry players must be willing to open their minds, shift their paradigm to adopt and adapt to new, modern and more effective processes and practces. The government is committed to equip our players with the latest technology and creating new competitive edges to ensure Sarawak can become the preferred destination for investors and venture capitalists. Towards this, ICAAS 2018 emphasises on presenting and deliberating on the field of knowledge areas in modern technology related to agriculture in line with the rapid changes that is happening around the world today, he said in his welcoming remarks of the ICAAS 2018 opening. Smart farming involves the integration of advanced technologies into farming practices in order to increase production efficiency and the quality of produce. Every aspect of farming can benefit from technological advancements. Therefore, the Deputy Chief Minister said it was timely for players to embrace digital technology in order to reap the benefits of modern technology. 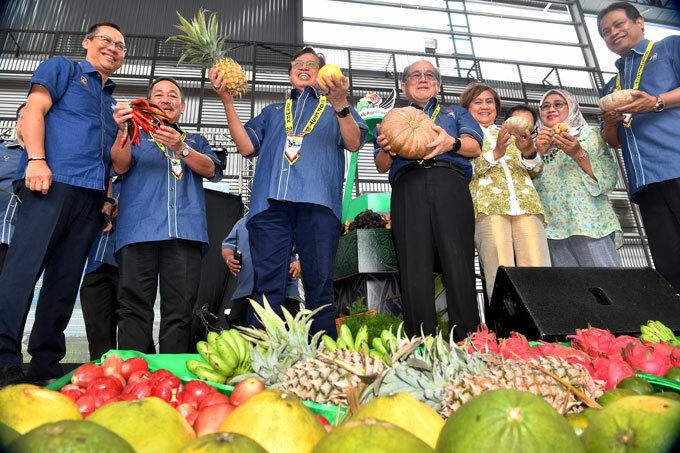 The inaugural Sarawak Agrofest succeeded in generating more than RM1 million worth of sales, having attracted more than 20,000 visitors when it was held from Oct 20 to 28. Assistant Minister of Native Land Development Datuk Roland Sagah Wee Inn said that while the total sales volume was officially recorded at RM939,554.25, the amount could be more than RM1 million if outside-the-counter deals are also included. This does not include sales made outside the counter. There are other deals being made with other entrepreneurs through other arrangements. I believe the sales itself will be more than RM1 million. That is good business, isnt it only for one week (duration of the Agrofest), he said at the Sarawak Agrofest 2018 appreciation dinner in representing Deputy Chief Minister Uggah. According to Sagah, the average sales per participant based on the total sales volume was RM8,388.88. There were 71 participants for the agro sales and 41 for the agro kitchen. Sagah also urged the staff and officers of the Ministry of Modernisation of Agriculture, Native Land and Regional Development to take up the challenge to ensure Agrofest 2019 next year is a bigger success with more sales and more participants. He said Chief Minister Datuk Patinggi Abang Johari Tun Openg agreed to make Agrofest an annual event, and to organise it in other regions in Sarawak. While Agrofest 2018 has proven to be success, there is room for improvement. we need to bring together key players throughout the state to exhibit and educate our farmers. Only through working together we can make uplift Sarawak agriculture industry and achieve the governments mission to be a net food exporter by the year 2030, he said. In its aim to further develop the agriculture sector, the Sarawak government had said it would allocate RM50 million to implement its agriculture development plans in efforts to become a net exporter of food products by 2030. Uggah said this was necessary to enable Sarawak to compete with countries in this region, as well as to ensure that the quality of food products is of international market requirements. Agricultural Science (ISSAAS) Congress 2018. We hope that by using the latest technologies, we will increase our productivity, make ourselves more competitive and enable us to reach the target we have set, he added. Smart Farming represents the application of modern Information and Communication Technologies (ICT) into agriculture. Following the plant breeding and genetics revolutions, smart farming is taking over the agricultural world based upon the combined application of ICT solutions such as precision equipment, the Internet of Things (IoT), sensors and actuators, geo-positioning systems, Big Data and drones. 1. Management Information Systems: Planned systems for collecting, processing, storing, and disseminating data in the form needed to carry out a farms operations and functions. 2. Precision Agriculture: Management of spatial and temporal variability to improve economic returns following the use of inputs and reduce environmental impact. It includes Decision Support Systems (DSS) for whole farm management with the goal of optimizing returns on inputs while preserving resources, enabled by the widespread use of GPS, GNSS, aerial images by drones and the latest generation of hyperspectral images provided by Sentinel satellites, allowing the creation of maps of the spatial variability of as many variables as can be measured (e.g. crop yield, terrain features/topography, organic matter content, moisture levels, nitrogen levels, etc). 3. Agricultural automation and robotics: The process of applying robotics, automatic control and artificial intelligence techniques at all levels of agricultural production, including farmbots and farmdrones. Smart Farming applications do not target only large, conventional farming exploitations, but could also be new levers to boost other common or growing trends in agricultural exploitations, such as family farming. Smart Farming can also provide great benefits in terms of environmental issues, for example, through more efficient use of water, or optimisation of treatments and inputs. Meanwhile, youths of today are not left out in the race to uniquely combine technology and agriculture. 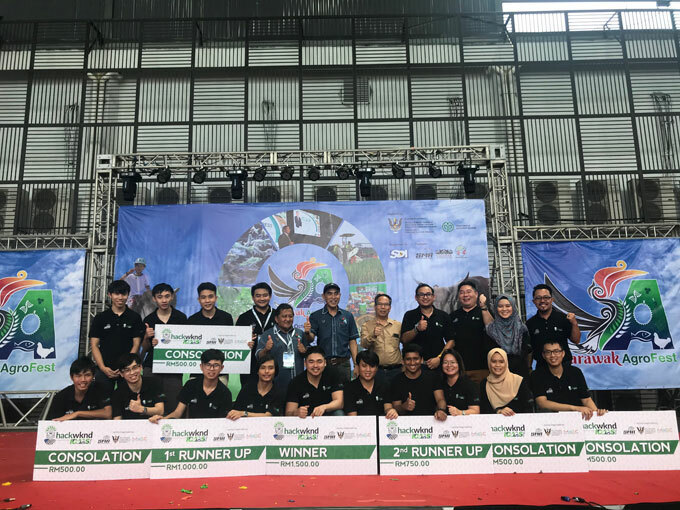 A shining example is the Internet of Things (IoT) Based Honey Harvesting Stingless Bee Farm Monitoring System which won the fifth edition of HackWknd held in conjunction with the ICAAS, held together with Sarawak Agro Festival 2018. Team XBeta with their IoT Based Honey Harvesting Stingless Bee Farm Monitoring System garnered the grand prize of RM1,500, followed by Team Redemption with Farming Monitoring System, and eFarmers with Solar Powered Smart Irrigation Control. The runner-ups won RM1,000 and RM700 respectively. Team Redemption was also awarded with the Peoples Choice Award for the most voted project at Sarawak Agro Festival. Organised by Sarawak Multimedia Authority (SMA) and supported by Malaysian Global Innovation & Creativity Centre (MaGIC), HackWknd ICAAS saw over 30 participations from universities and industry competing for prize pool of RM6,000. HackWknd ICAAS aims to produce the best technological enabling solution in the agriculture sector by addressing key challenges from Ministry of Modernization of Agriculture, Native Land and Regional Development (MANRED), and in line with Sarawak Digital Economy Initiatives, MaGIC said in a statement. HackWknd is a community driven hackathon aiming to gather the bright mind of people in engaging addressed issue with technological enablement for creative and innovative solution. The hackathon usually runs from 48 to 52 hours whereas the participants will develop a minimal viable product (MVP) for the given problem statements. HackWknd ICAAS was mentored by Daniel Vong (BAWA Smart Cane) and Johnson Chong from the Department of Agriculture Sarawak, and judged by Mohd Azhar Rashid (ILoveMedia), Tan Chee Kan (SMA) and Nigel Sim (Chumbaka). The hackathon ran from October 19 to 21, 2018 at MaGIC Sarawak Co-working Space as the satellite venue. Historically, the plantation or palm oil industry has been one of the key economic drivers for Malaysia, and this is still clearly the case as 2016 figures still indicates that the industry accounts for 13 per cent of our GDP. Despite its importance, the industry has been rather slow on the uptake of integrating digital tech into their operations as some analysts point out that many companies are unmotivated to upgrade themselves due to an abundance of labour and foreign labour resources in the country. However, with increased foreign worker levies and minimum wages, it is getting costlier for these companies to avoid going digital and so, there has been increasing interest in the digital solutions available out there for planters. While there still isnt any tech out there that can automate palm oil harvesting and eliminate the need for physical labour all together, Khor Kheng Khoon the founder and managing director of plantation management solutions provider LintraMax Sdn Bhd (LintraMax) believes that the next step for planters will be to digitalise a lot of their administrative operations. As the world population grows, the demand for edible oil will only increase so there is no doubt that the plantation industry is very resilient, Khor told BizHive Weekly in an interview recently. However, companies still need to adopt technology into their operations as human resources are getting harder to find, lands are getting scarce even in Sarawak, and the cost of quality land is only rising higher. Because of this, planters need to make their operations more efficiency and digital tech is one way for them to gain efficiency while being able to control their cost better, Khor asserts. He went on to detail that many plantation companies in Malaysia, especially smaller companies, are often still manually driven. A lot of them are (Microsoft) Excel-based, they incorporate manual book keeping, manual systems, manual data entry and so on, he said. What we (LintraMax) do is to bring forth these plantation companies from being manual intensive to becoming a digital plantation so to speak, using IT software and other technologies to manage it efficiently. We provide digital management products and services that help plantations become more efficient by being less dependent on manual labour and easier to supervise. Khor explained that this is easily achieved just by incorporating some of LintraMaxs core products. For example, with our Quarto product which is an integrated cloud-based plantation management system tailored specifically for palm oil businesses, companies can utilise this all-in-one solution and easily manage their operations on a single system that supports various key operation functions. These key features include functions such as accounting, staff payroll, general worker and harvester check-roll, procurement, inventory management, nursery management and vehicle management, he said. He explained that the system can easily simplify some of the administrative processes in a plantation company, saving valuable labour and time resources as a company would no longer need to rely heavily on large teams of administrative staff to ensure that all operational data is keyed in and kept up to date. Being a cloud-based system, Khor commented that data from a companys plantations can easily be seen by its management or headquarters whenever and wherever they might be in the world, as long as they have access to a working internet connection. With their data so easily accessible online, management workflows are streamlined as managerial staff can easily supervise and control operations through the system all while making quicker and better business decisions, he said. Adding to that, Khor detailed that the Quarto system also included several analytical tools that could help interpret historical data from plantations to visualise trends and make forecasts. Things like how much yield they can expect can be forecasted and besides that, they can also see if there are any areas where they can improve on. For example, companies can easily view the average time taken to transport fresh fruit bunches (FFB) to the oil palm mill or their workers efficiency in harvesting. Taking the digitalisation of plantations one more step further, LintraMax has also just launched their newest product, a mobile application that complements to their Quarto system, earlier this year. According to Khor, their new QuartoConnect is an application that is to be used on site as it functions as a tool for planters to digitally record data of their activities on the field which will then be stored in a cloud-based system. We saw that there was still an information gap between field operations and monitoring, and that is why we have come up with QuartoConnect. This is our approach to extend the digitisation of plantations to include work at the field level as well, not just at the main office. Khor shows the QuartoConnect loaded up on a Portable Data Terminal (PDA) device. A lot of planters are still very manual with their recording and reporting of field data. This is not only labour intensive but also very time consuming as it may take a long time to report the data back to the main office, Khor lamented. To ease this process, the main features that LintraMaxs mobile application boasts is a biometric worker attendance record, a crop harvesting log and a crop evacuation log. Khor explained that these three main features were developed as they (LintraMax) had discovered that a lack of workers, poor crop harvesting quality and crop losses were among the biggest operation challenges faced by planters. 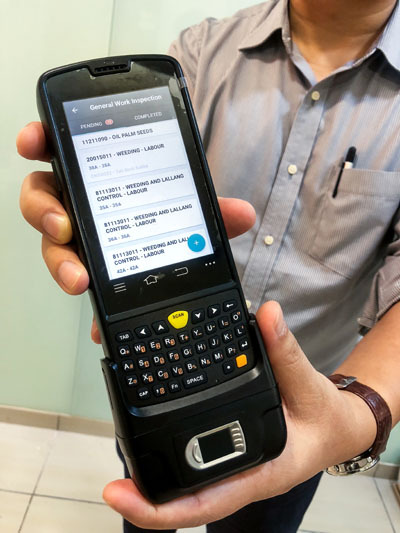 The mobile application can be launched on any android device that has a biometric device to read finger prints and a scanner to scan QR codes. With worker attendance, workers just have to scan their fingerprints on any device with the application launched and it will automatically record their attendance. By scanning their finger prints, we reduce to possibility of false attendance records and the number of ghost workers in a plantation. For the crop harvesting and crop evacuation function, when a worker brings over their harvested FFBs, you just need to key in the amount they have brought and the data is automatically saved while the app directs for a QR code to be printed. The QR code can then be scanned at the oil palm mill and the time taken to transport the fruit to the mill will be automatically recorded while any unscanned QR codes can show the amount of lost crops, he explained. By digitalising these processes, Khor believes that the traceability and the monitoring of field operations can be drastically improved and the issues of ghost workers, missing crops and inefficiencies in transporting corps be significantly minimised causing plantations to see potential yield increases. Many of our customers have been increases in their palm oil yields as a result of their increases in operational efficiency. While some increases might seem small, you need to remember that for large companies, even a 0.1 per cent increase in yield from their plantations can easily translate to millions. While Khors products have demonstrated their value through their LintraMaxs extensive client list throughout the ASEAN region, he guides that this is only the beginning for the digitalisation of the plantation industry. There are a lot of other solutions that we plan to tackle once the technology comes about, these include tech such as IoT and better analytics. Ten years ago, many companies would be reluctant to consider such solutions but nowadays tech is so readily available around us that it is changing the way we operate at an alarming rate. Industrial hemp a possibility in Sarawak? Over the years, the hemp plant has gotten a pretty bad rep worldwide as it is closely associated with the illicit drug marijuana. However, the truth is, while both hemp and marijuana are from the cannabis plant family, hemp is completely different from marijuana in its function, cultivation and application. Explaining this difference, Philip Warner, managing director of Ecolife Science Industries told BizHive Weekly that the main differentiating characteristic is that hemp has no illicit drug value. What makes marijuana intoxicating is its high content of a chemical substance called THC, but hemp plants are different in the sense as that they dont have high THC levels so they cannot get an individual high or intoxicated. The threshold for how low THC levels have to be in order to be considered hemp differs from country to country, but the general consensus is that a less than one per cent THC makeup will not have any illicit drug value to anyone, he explained. So with no illicit drug value, what exactly is hemp and how can it benefit us? According to Warner, hemp is an extremely useful plant that can be cultivated to produce a variety of products, from textiles and building materials to food and medicine, the application of hemp to our daily lives seem to be limitless. Almost every part of the plant can be used, its flowers can be used to create valuable medicine, its seeds to produce food and oil, and its leaves and stems to produce textiles and building materials. If you were to catch the next spaceship to mars, and they said you could only take on thing with you, what would you take? Youd take hemp seed because not only will it grow, propagate and reproduce itself, you can eat it, you can sue it to build your house, you can use it as medicine, you can use it as clothes, you can write with it, you can use it as fuel. There so many different applications for it so youd be much better taking hemp with you than say, wheat or bananas, he said. Adding to this, Dr Kylie OBrien who is the associate professor at National Institute of Integrative Medicine (NIIM) Australia states that the food component from hemp seeds is also extremely nutritious and has much promise as a functional food for the prevention and treatment of many health conditions. I think there is a huge number of potential health benefits in consuming hemp oil or seeds as a functional food because the research has shown very clearly that some of the main components (polyphenols, flavonols and flavonoids) of hemp seed and oil have tremendous amount of health benefits. For example it is antioxidant and anti-inflammatory, and research suggests that it has anti-cancer properties, is good against heart disease, protective against diabetes, neuro degenerative disease, skin disorders and any disorder underpinned by inflammation. And its not just preventative for diseases, the hemp seeds and oil itself is extremely nutritious as it is full essential fatty acids, high in protein, and rich in vitamins and minerals, said Dr OBrien. Both Wagner and Dr OBrien were in Sarawak recently giving talks at the International Scientific Conference on INdigenous Crops 2018. Hemps high nutritional and medicinal value has turned hemp seed and oil products to high value commodities and because of this, Warner believes that this is something that Sarawak should latch onto given the abundant landscape here. If you were to ask me how this region can start capitalising on hemp in their agriculture industry, I would suggest starting on food production from hemp. Hemp seed foods like big seeds for hemp oil that is rich in essential fatty acids like omega 3, protein, vitamins and minerals, and antioxidants. And after extracting the oil from the hemp seeds, the protein left in the seed can be processed to make meal, flour, breads and protein powder. All this are what is possible right now for this region, he guided while adding that our tropical climate would very suited to growing variants of the plants whose seeds are much larger than the ones we see on the market. If you grow hemp for food, you can either export it to other countries as superfoods or you could use it to supplement to local diets and make the state a little more self-sufficient. All nations will face crises of health of their people, and it will send them broke if they use conventional foods and medicine. So, we have to change now to better foods and more complimentary medicines which are not owned by multinational giants that are only interested in making profit. By doing so, we can help boost the economy while saving on some hefty healthcare costs as the local population will be healthier with their enriched diets.